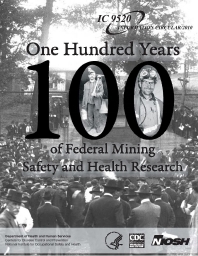 This publication provides an historical overview of research undertaken by the U.S. federal government over the last 100 years to improve the health and safety of our nation's miners. Federal research efforts began with the establishment of the U.S. Bureau of Mines (USBM, or the Bureau) in 1910. They have continued over the past century, even after the Bureau's closure in 1996. It is hoped that this publication will give the reader an appreciation for the work of mining health and safety researchers over the past century, and of the miners served by this research. This history is generally chronological, with a few exceptions. Because of their prominence and direct links to Bureau research, most of the Public Health Service mining studies completed before 1970, when NIOSH was established, will be discussed in a single section, even though the work spanned many decades. Likewise, for convenience, the brief histories of the Bureau's mining research centers are located in one section.